"I'm so fly that's probably why it feels like I'm falling for the first time." Skydiving. Nothing equals it. It's the world's highest, fastest and most spectacular sport. Base jumping is more dangerous but it's not as high and there's barely time to free fall which is the rush. It's not a sport for the financially strangled as a tandem jump will eat $300 out of your hand for a brief experience. If you're thinking of taking the plunge give it some thought, do your homework. What's your dream drop zone? If it's a lovely beach then head down to Byron and stay a night there. Swim with the sharks. If you don't care then look at other deciding factors like how high you jump out of a perfectly good plane from. The higher the better- that's more free fall. It can range between 8000-1400 feet. You can also look at costs and colour of parachute suits. You are free falling at terminal velocity which is close to 200 km/hr. Terminal velocity is a fact of physics and fluid dynamics. Terminal velocity means the speed of an object is constant due to the restraining force of the fluid through which it's moving. Like the Titanic sinking. When free falling, terminal velocity is achieved when the downward force of gravity equals the upward force of drag. One place promotes your terminal velocity as 350 km/hr! I'd be asking some questions and doing some maths with a pen and paper. Pulling in the limbs increases speed but it's unlikely to be by that much. I'd be insisting on pulling in my limbs. If they are going to talk turkey then I want to eat turkey. 'Don't lie to me. Tell me where did you sleep last night?' I'm tempted to contact them and ask for the equation. If you are an aeronautical physicist leave me a comment. On the ground you will slip into something more comfortable and be given vital instructions. Listen with all your mind and get them in your head. Getting it wrong can cause a mid air emergency or a double fatality. I did my first jump with a back flip exit. Don't exit until he has securely attached himself to you and confirmed that. If you are jumping front on like a normal person, keep your eyes skyward and don't look down. It may throw you and there is no leeway for a panic attack. You will see plenty of the ground. You will exit with your arms across your chest. A tap on the shoulder means to go into free fall position. Maintain it and feel that terminal velocity. It may only last 50 seconds. Don't flail your arms about and the next tap on the shoulder is critical. It means fold your arms across your chest because his altimeter is telling him it's time to pull the chute and he doesn't want it failing to open properly because your arms are tangled in it. You need a 'you beaut' canopy, every bit of it. Be prepared for the opening of the parachute to pull you skywards. Then it is the most enchanting floating feeling off earth. He may give you a turn on the toggles. If you have seen skydivers land, they are dropping to earth at speed. Gravity has a loud voice. They run when they hit the ground to lessen the impact. Do your best to run as a tandem with you in the lead. 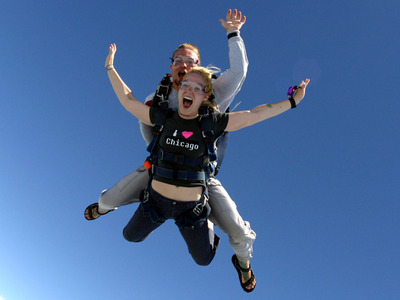 Statistically, skydiving is safer than car travel. However, I have been personally affected by three SAS skydiving tragedies, but they don't jump under normal conditions like you will. 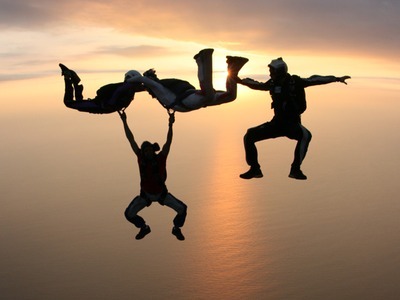 If you do want an extra buzz you can jump solo with two instructors holding you until your chute opens. You will fork out extra dollars but it's an exciting option. Just enjoy your jump.